Add this to the list of the ridiculously cool installations that I can only dream of seeing—a full scale model of a building facade has been laid on the ground (so that visitors can hang out on it) and is reflected by a giant mirror, offering the illusion that people are hanging out of windows! 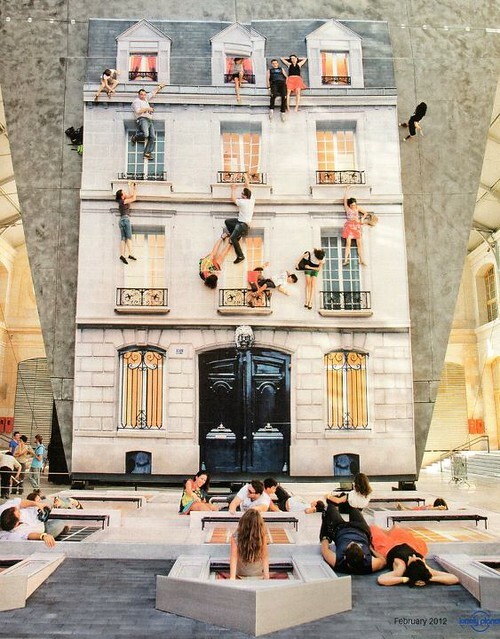 The installation is now at the Parisian gallery Le 104 and has been created by artist Leandro Erlich. Learn more about Erlich here. that is absolutely brilliant. so fun!